Keane with backs coach Nigel Carolan. 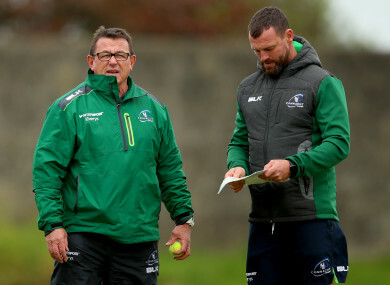 NEW CONNACHT COACH Kieran Keane agrees they are under pressure to deliver early results with three of their four opening matches at home at the Sportsground. And given the new structure of the Pro14, that means Connacht will have played 30% of their home matches in the competition before the end of September. “Yes, there is pressure, there is no doubt about that,” says the Kiwi, though he wouldn’t have it any other way. “I am actually rather pleased that we are playing at home. Because judging the way the boys responded with the pre-season game here, it lifts them. “I am hugely in favour of the fact, there is pressure, there is no doubt, but to be frank I wouldn’t want to be in any other place,” said Keane. His side, who have 10 home and 11 away matches in the new-look competition, open on Saturday against Glasgow Warriors, entertain the Cheetahs the following week and then travel to face the Dragons before returning home to host Cardiff Blues on 23 September. The opening game pits him against his old boss Dave Rennie just weeks after the two of them concluding their coaching duties with the Chiefs and the two of them have a wager on Saturday evening’s game. Keane may have to rest some of the Irish players who did duty in the USA and Japan but he will mix it up over the coming weeks. “There is a couple that we are going to manage. It’s just horses for courses really and we are limiting some of the players because of their injury-status and the fact that they need a break. What we are trying to do is manage that the best we possibly can,” he added. Email “'I'm a very competitive man': Keane ready to offer former boss Rennie a stern opening test in Pro14”. Feedback on “'I'm a very competitive man': Keane ready to offer former boss Rennie a stern opening test in Pro14”.